The Amsler Grid is often used to monitor diseases affecting the retina, especially macular degeneration. Any abnormal area in the grid, or any change in its appearance should be checked with an eye examination on an urgent basis. 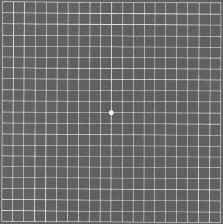 This Grid is used to detect vision problems which cause distortion or blind spots at or near the center of your vision. To use it, cover one eye and stare directly at the dot. Note whether there are any areas where the lines don't look straight or where there are lines that are difficult to see easily. Repeat the test with your other eye. This is a replica of the Vision Testing Card used to measure visual acuity at near focal points. During an eye exam, the actual size card would be held at a standard distance(often 14 inches) and the patient would be asked to read the smallest characters possible with each eye individually. This helps to determine the need for reading glasses or bifocals and helps to diagnose conditions which affect reading vision differently from distance (20/20, etc.) vision. Though this replica is smaller than the actual card, you can simulate the test by reading the card at 10-12" with each eye separately. Your near vision is expressed as an "equivalent" of 20/20, 20/40 or as a description of the character size seen at a certain reading distance. 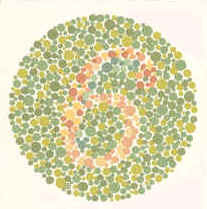 Red-green color blindness is very common among males, affecting approximately 7% of the male population. It is much less common in females, affecting less than 1%. 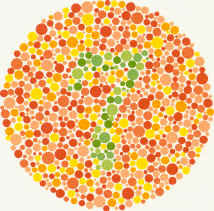 These pictures are used to help diagnose the most common kinds of color blindness. 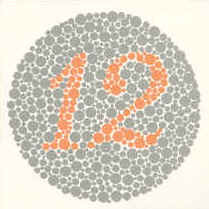 Anyone with normal vision, even if color blind, can see the "12". 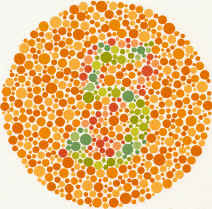 Remember, the many males that are color blind can perform almost all tasks normally, except those that require fine color discrimination-for example sorting colored electrical wires when many colors are present.